The horehound waited with open leaves, soaking up the sun and perfuming the air with its light, refreshing scent. 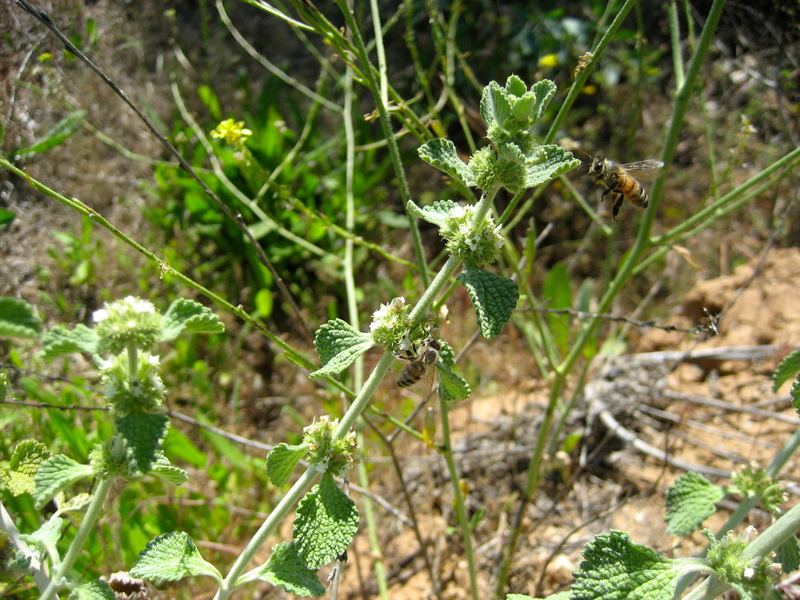 The field was alive with the buzzing of hundreds of bees, so it was only a matter of time before this horehound plant would be visited by the flying caretakers. For the bees, each time they lit upon a plant and sucked up nectar, it was like visiting home. They gathered sustenance, fulfilled their mission and recharged themselves with the good feeling of being productive. They gave to the plant, attention and the promise of more generations. They liked to spread the good vibes around. On the days when we visit the special people in our lives, we offer our love and friendship to them and receive love reciprocated. Just by buzzing around in an attentive manner, we help our loved ones because we remind them that they are important. That reminder spreads among others we encounter like pollen from one plant to another so that everyone touched bya smile or a thoughtful act gets the messages: Friends matter. Loved ones matter. We all matter. Happy day to all, and to Mothers who attend to all their children’s needs, Happy Mother’s Day! Thank you Yuka! Happy Mother’s Day. I hope it was filled with love.